Laundry detergents help in removing dirt, grime, and stains from our fabrics. Most of them have been engineered to leave your clothes smelling naturally clean and feeling softer. These laundry essentials come in different forms; powder, liquid, and pacs form. All in all, they are all after fighting stains and making cleaning an easy affair. When buying a laundry detergent, it’s important to consider the type of washing machine you’ll be using it in. While most of them are designed to be compatible with both the standard and HE models, others may give you a hard time when employed in wrong machines. Again, it’s important to take into account the ingredients used in the detergents. Some pack loads of harmful ingredients that may cause you more harm than good at the end of the day. Bearing in mind how painstaking it would be for you to identify the best laundry detergent, we’ve selected the 10 best laundry detergents to give you a narrower scope to choose from. We need not say what Tide is. It’s an iconic brand specializing in delivering an array of reputable detergents for all household chores. This orange bottle holds lots of cleaning and stain removing power therein. It’s a 3-in-1 detergent in the form of pods that dissolves quickly when put in either cold or hot water. It claims to be 6x more efficient in cleaning dirt and grime, brightening your fabrics and fighting stains. 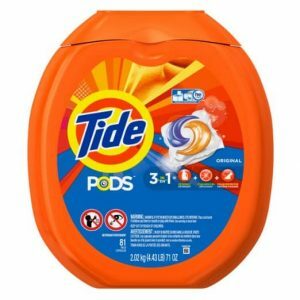 Again, Tides Pods has 90% cleaning ingredients and only 10% water making it worth your every buck. Quality doesn’t always ride on high prices. Anyone who has used this laundry essential can attest to that. 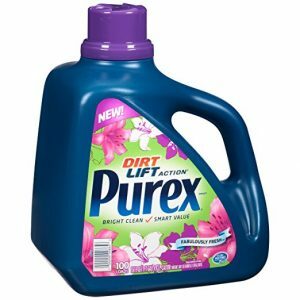 Purex Liquid Detergent’s 150 oz bottle has enough powerful detergent to take you through 100+ loads. Each capful of this high performer packs a load of tough stain removers for tough stains be it coffee, grass, blood stains or any other form of stain. It’s compatible with both the regular and HE washing machines. 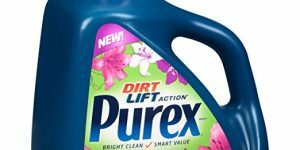 Again, Purex is a smart choice for those with ultra sensitive skin. It has a heavenly fresh and clean fragrance that’s not overly annoying. 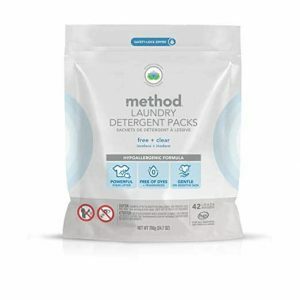 This method laundry detergent will efficiently remove the toughest dirt, stains, grease, and odors in your clothes. It is a powerful cleaning agent that lifts off stains, brightens the clothes colors with less effort. Moreover, it has a biodegradable formula and non-toxic. It usually cleans well clothes without leaving any deposits that can irritate skins or ruin fabrics. This laundry detergent is perfect to utilization with either cold or hot water and also effective to utilize in cleaning dishware and soften your hands. You only need to toss a pack on the water and adore your time during laundry. When your clothes are stain-stricken, and no other detergent can save them, you need a detergent that’s not only powerful but tough. That’s what this Arm and Hammer is. 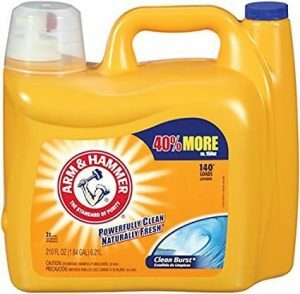 Arm and Hammer is a familiar brand among commercial Laundromats, and its reputable products are highly favored by many families. Its 3320000106 detergent has zero phosphates making it safe for any skin. The package contains 2 bottles each with enough soap for at least 100 loads. The expertly formulated detergent will leave your cloth smelling naturally fresh and feeling soft. It also remains extremely tough on stains while being soft and tender on your skin. Again, it’s safe for use on all machines and is friendly to your septic tanks. 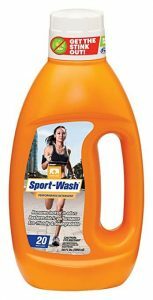 Nathan Sport-Wash Performance is designed to fight notorious odors that won’t come off your fabrics with other detergents. This detergent works well in all temperatures and with any type of machine. It utilizes special biodegradable formulas that trap soil in high-tech fabric thereby bringing it back to its original condition. Amazingly, it does all these without affecting the original color of your clothes. It only helps the color to remain intact and vibrant. Additionally, Nathan is a solution to messes that other detergents may have caused on your fabric. 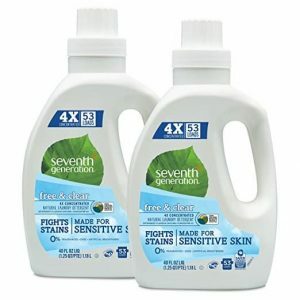 Seventh Generation is an all-natural detergent specially designed for the sensitive skin. As such, it has no added synthetic fragrances, dyes, or brighteners. This clinically tested and USDA approved detergent uses an all-plant-based formula to fight the most stubborn stains and leave your fabric moisture-nicking, fresh smelling, and odor-free. Besides, it’s much more efficient in cold water than other contenders are in hot water. This will not only save you electricity bills but also help in giving your fabrics a longer life. 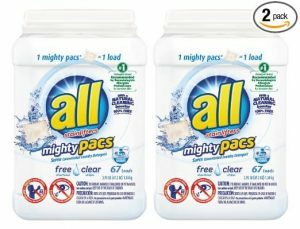 For those on tight budgets but still need a real stain remover at an extremely friendly price, All Mighty Pacs is for you. This is a super concentrated detergent derived from a hypoallergenic formula to make it safer for the ultra sensitive skin. It has no fragrances or dye. The package has 2 bottles each enough for 67 loads. This means that the 2 will offer you 134 amazingly clean and stain-free loads. The detergent can be used in either cold or hot water and is safe for use in both standard and HE washing machines. You won’t be wrong to call this diva a miracle in a bottle. This is what is on most ladies’ lips today. You’ll be forgiven if you ordered it to save on your perfume; furthermore, lots of people are doing it today. 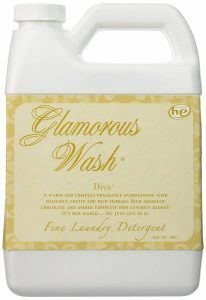 Tyler Glamorous Wash is a fine laundry detergent that can be used in washing machines or used for hand washing. Users reported falling in love with the dramatic scent that filled their house when the washing machine was running. For almost 2 decades now, Method has been striving to deliver high quality, effective and safe personal care products for the modern home. It’s just unbelievable how efficient plant-based laundry detergents can be. This small easy-to-carry bottle is enough for 50 loads. The detergent is ultra concentrated, so you need little of it for each load. What this means is that you’ll be using less water since it will leave no residue behind. Again, the package comes with mess-free dispense pump to make measuring easier, fast, and accurate. Charlie’s Laundry Soap has been the most reviewed and the most highly rated so far. It’s a perfect pick for both home use and commercial purposes. It has been praised for being extremely safe for the sensitive skin since it causes no irritation or itchiness of any kind. This goodness can be attributed to the fact that Charlie’s Soap doesn’t contain any GMO in its formula and has no added fragrances, perfumes, or chemical brighteners. Moreover, it has been designed for use in any machine and does well in either hot or cold water. 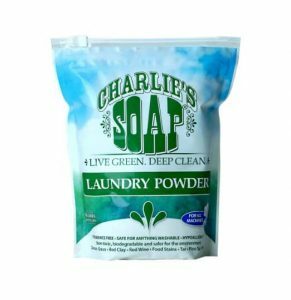 Charlie’s Soap with its non-GMO formulation has proven to be the most efficient and safe laundry detergent so far. Tides is also a reputable one though some users reported slight irritation after use. When it comes to fighting stubborn odors, Nathan has the solution.